Accueil > Côte d'Azur practical information! 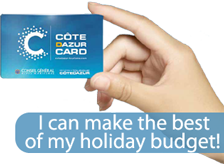 Here you will find all the information useful for preparing your stay on the Côte d’Azur. With the Nice Côte d’Azur International Airport, France’s 2nd busiest airport, the Côte d'Azur is in reach of over 35 countries and 105 destinations, served by 59 airlines. Once there, distances between the main towns of the Côte d’Azur are short, and access is easy. The Moyen and Haut Pays are never far from the coast, with the highest summits and winter sports resorts never more than 1h30 away. The Côte d’Azur offers a range of thematic stays all year round. Welcome.